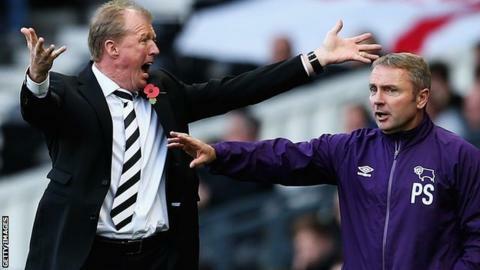 Derby County's success under Steve McClaren this season can be partly put down to a refusal to conform to the 'potty-mouth' footballing stereotype, according to coach Paul Simpson. The Rams are second in the Championship on goal difference and Simpson told BBC Radio Derby the ability to stay calm has "definitely" helped their cause. He said: "If you're ranting and raving and swearing, you haven't got control. "We say you are losing it so you may as well come and sit in the dugout." First-team coach Simpson joined McClaren at Derby when the former England boss was appointed as head coach in September 2013. "It was a surprise to me when we all came in here," said Simpson. "When we arrived I realised that Steve has turned over a new leaf and very rarely swears. "We have realised that when you swear at people, it doesn't get the reaction you want. "We try not to swear if we possibly can, and we certainly don't use foul and abusive language in the technical area when we are talking to officials - which seems to be the common trend." Simpson said the crackdown, which he described as "refreshing", was motivated by a respect for officials, opponents and team-mates. But he believes it has also helped the team improve as they look to control the "inner chimp" which sports psychiatrist Dr Steve Peters talked about in his book 'The Chimp Paradox'. Simpson continued: "We are always talking to the players about keeping control of your chimp and not let it take over your head and rule your decision making during a game. Who is Dr Steve Peters? The former Rams winger said there was no zero-tolerance policy at the club, but swearing was certainly frowned upon. "It's like when you bring your kids up. You have to just say something to them or sometimes just a look is enough and it tends to nip it in the bud," he added. "Whatever walk of life you are you in, if you are ranting and raving and swearing at people, you haven't got control of yourself."